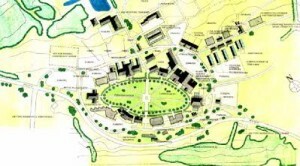 The master plan was developed to investigate the major physical alternatives available in considering future development at Essex Agricultural & Technical Institute in 1995. Four Schemes were designed to implicitly look to foster a village concept, with buildings functionally clustered around a meeting green; larger and more specialized buildings and facilities are further out from the green, parking and circulation convenient but not interfering with major functions. At the same time all schemes look into various possible reconfigurations for growth within the school and its programs. This scheme is based upon the developing philosophy of the school wherein students, particularly high School juniors and seniors, will be encouraged to participate in courses with post-graduates. This scheme also takes into consideration growth areas now being projected by faculty and administration such as Environmental Technology and Health fields, and Retail administration. Scheme D was selected by the Board of Trustees and Administration for its viability as a scheme for future growth. The projected capital cost of this multiple phase project.